Biggin Hill is best known for its role during the Battle of Britain in the Second World War, when it served as one of the principal fighter bases protecting London and South East England from attack by German Luftwaffe bombers. Over the course of the war, fighters based at Biggin Hill claimed 1,400 enemy aircraft, at the cost of the lives of 453 Biggin Hill based aircrew. The airport has a CAA Ordinary Licence (Number P804) that allows flights for the public transport of passengers or for flying instruction as authorised by the licensee (Regional Airports Limited). It specialises in general aviation, handling a spectrum of traffic from private aviation to large business jets. It currently has no scheduled airline service, as flights using the airport are not permitted to carry fare-paying passengers. The airfield was originally opened by the Royal Flying Corps (RFC) during the First World War. At first in 1916 Koonowla House was requisitioned by the War Office in 1916, for the RFC to conduct wireless experiments. Then on 13 Feb 1917 the RFC transferred there (from their long time HQ at RAF Joyce Green, Dartford), and established it as part of the London Air Defence Area, using the adjacent Cudham Lodge estate which contained a huge undivided field, ideal for aircraft. The station was responsible for defending the capital against attacks by Zeppelins and Gotha bombers. To this end, 141 Squadron of the RFC was based at Biggin Hill and equipped with Bristol Fighters. Between the wars, the airfield was used by a number of experimental units, working on instrument design, ground-based anti-aircraft defences, and night flying. The base was closed between 1929 and 1932, during which period reconstruction work took place including the building of new hangars. During the Second World War the airfield was one of the commanding bases for the Battle of Britain, with both Spitfires and Hurricanes from a variety of squadrons being based there. The squadrons based at Biggin Hill claimed to have destroyed 1,400 enemy aircraft, at the cost of the lives of 453 Biggin Hill based aircrew. Because of its importance to the capital's defence, the airfield itself became a target. Between August 1940 and January 1941, the airfield was attacked twelve times, the worst of which wrecked workshops, stores, barracks, WAAF quarters and a hangar, killing 39 people on the ground. After the war, Biggin Hill was briefly used by the RAF's Transport Command, and then became a base for both regular and reserve fighter squadrons, flying Spitfires, Meteors and Hunters. A fatal incident involving the loss of three Meteors on 18 June 1951 (see incidents and accidents below) caused the station's continued use by the military to be called into question. However, in 1958 Biggin Hill ceased to be an operational RAF station, becoming the Officer and Aircrew Selection Centre for the RAF. Due to the impending closure of the nearby original London Airport at Croydon, from 1956 much of the civilian light aviation from Croydon relocated to Biggin and it became a joint civilian and military airport. Croydon closed completely in 1959, at which time Biggin Hill became a mainly civilian airport with only occasional military flying taking place. Towards the end of 1963, the Orpington Urban District Council (within whose boundaries the airfield lay) was approached by the Board of Trade as to whether the Council would purchase (effectively from the RAF) Biggin Hill airfield. In 1964, on formation of the London Borough of Bromley, which absorbed Orpington, the offer to purchase was open to the new borough. Protracted negotiations were held with the Board of Trade and later the Department of Trade and Industry. At a special meeting on 15 June 1972 the Council decided to purchase the airport by a recorded vote of 41 to 9. The purchase was eventually completed in 1974. In May 1992 the Department of Transport issued a direction to the Council under s.13 of the Airports Act 1986. The effect of this direction, which affected airports generating turnover of £1million or more (Biggin Hill just scraped into this limit), was to require the Council to set up a new company for the purpose of operating the airport as an independent commercial undertaking. To comply with the direction would have required the transfer of all the assets and liabilities to the company with a consequential loss of Council control over airport activities. In the circumstances, the Council decided that the granting of a 125-year lease would enable more control to be retained than an outright disposal of the freehold or by a transfer to a local authority company with an uncertain future. In May 1994, the airport was leased to Biggin Hill Airport Limited ("BHAL"), now a subsidiary of Regional Airports Limited, for 125 years. In 2001, the London Borough of Bromley as freeholder of the airport succeeded in an action in the Court of Appeal. The court ruling prohibits the airport operators from allowing tickets to be sold for flights into and out of the airport, thus preventing its use for scheduled or holiday charter flights, but allowing business aviation and corporate shuttles. In May 2017 a runway (29/11) was permanently withdrawn from use. Replicas of Hurricane and a Spitfire stand watch over the entrance to the chapel of the former RAF station. 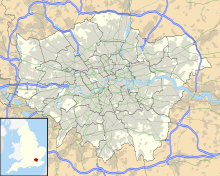 The airport is located on a hilltop, just to the east of the Bromley to Westerham road (A233) and about 1 mile (1.6 km) to the north of the town of Biggin Hill in the London Borough of Bromley. It is in a rural area to the south-east of Greater London, outside of the Greater London Built-up Area. The small village of Leaves Green lies adjacent to the north-western perimeter of the airport. The airport has one runway aligned roughly north-south. The runway (03/21) is 1,820 metres in length, making it usable by aircraft up to Boeing 737/Airbus A320 size, and it has an Instrument Landing System. Radar air traffic control (ATC) services are provided by Thames Radar at the London Terminal Control Centre, while procedural approach and VFR ATC services are provided by the airport itself. Despite the ban on scheduled services, Biggin Hill is used by a large number of business flights by business jets and similar sized aircraft. The airport has a passenger terminal, located on the A233 road just south of Leaves Green, which provides facilities for such flights, including departure lounges, a licensed café bar, and customs and immigration facilities. The current RAF Biggin Hill is a small enclave on the western boundary of the airport to the south of the passenger terminal, and contains the headquarters of 2427 Squadron of the Air Training Corps. Next to this is St George's Chapel of Remembrance. This brick built chapel was erected in 1951, to replace an earlier chapel destroyed by fire, and now serves as a memorial to all the aircrew who died flying from the Biggin Hill Sector. It is surrounded by a garden of remembrance and has gate guardians in the form of full-sized replicas of a Hurricane and a Spitfire, representing the aircraft that flew from the former airfield during the Battle of Britain. The replicas replaced genuine aircraft that formerly served as the guardians. Air Marshal Hugh Dowding laid the foundation stone. The chapel was taken out of the RAF's control in 2015, and is now run by Biggin Hill Airport. Besides the passenger terminal and RAF enclave, other former RAF buildings still exist in the 'North Camp' to the west of the main runway, including the Sergeant's Mess of 1932, the Airmen's Institute of circa 1926, the former Station Headquarters building of 1931 and several barrack blocks. The buildings, which are Grade II listed, are in a redbrick neo-Georgian style typical of military airfields of the interwar period. They have been vacant since the Officer and Aircrew Selection Centre closed in 1992, and were added to English Heritage's list of buildings at risk in 2006. The 'South Camp', situated to the south of runway 11/29, was transferred to civil usage in the 1950s and now consists of a utilitarian collection of hangars and sheds, together with a modern office park. It now contains many aviation related businesses, flying clubs and flying schools. Many private light aircraft are based on the airport. From 1963, Biggin Hill airport was the venue of the Biggin Hill International Air Fair, an annual airshow that usually took place towards the end of June. On 5 July 2010 Biggin Hill Airport Ltd cancelled the 25-year contract with Air Displays International (the Air Fair organisers) without warning, a few weeks after the 2010 event, during which the Air Fair had attracted record breaking crowds. Construction on a new state-of-the-art hangar alongside the Passenger Terminal commenced in October 2010. Excavations of the site uncovered underground war-time fuel tanks and associated pump rooms; these were re-covered during the same building works. Construction was planned to finish late in Spring 2011. Biggin Hill is the location of one of the four "stacks" for aircraft landing at Heathrow Airport, and is used by aircraft approaching from the south east. It uses a VOR navigational beacon with the identifier "BIG". Noise from aircraft using this stack is often wrongly attributed to aircraft using Biggin Hill Airport. For 60 years (to 2016) an Air Scout centre has been located on the grounds of the airport. The centre allowed young people aged between 7 and 18 to take part in aviation activities with their scout groups. In 2016, Biggin Hill Airport Limited, which has historically claimed to support young people coming into aviation, rescinded its sub-lease to the Scout Aviation Centre in order to make way for new car parking spaces, giving them until 30 September 2016 to vacate their home of some 60 years. The airfield still retains its history by the continued restoration projects running at the Biggin Hill Heritage Hangar. IntotheBlue experience days, a UK company within the airfield allows members of the public to fly alongside a Mk9 Spitfire in a 1950s Harvard. Projects like this hold a timely reminder to how important the airport was during the Second World War. Commercial service to the airport has previously been rejected. An application by the airport to allow such flights around the time of the 2012 London Olympics was rejected by Bromley Council in March 2011. Under the terms of its lease, no scheduled or fare-paying passenger services are permitted to operate to or from the airport. On 18 June 1951, three Meteors crashed and their pilots were killed in accidents, all three crashing in an area of about 100 yd (91 m). The first, a Meteor VIII piloted by Flight Lieutenant Gordon McDonald of 41 Squadron, crashed shortly after take-off, corkscrewing as pieces of structure fell from the aircraft. The aircraft hit a bungalow, killing the pilot. The jet wash of his flight leader was named as a possible cause. Within seconds of this accident two Mark IV Meteors of 600 Sqn, piloted by Sergeant Kenneth Clarkson and Squadron Leader Phillip Sandeman, both circling over the wreckage and preparing to land, collided at 2,000 ft (610 m) above the scene. Although Sandeman managed to bail out, he was killed when his parachute failed to open. Clarkson was killed in his aircraft. A week after this incident, another Meteor overshot the runway, narrowly missing passing cars. After these incidents, several residents stated they would be "selling up" and there were calls for traffic lights to be installed on the Bromley road for use during take-offs and landings. On 15 May 1977, during the annual International Air Fair, a Bell 206 helicopter was in a mid-air collision with a de Havilland Tiger Moth at the airport. The Tiger Moth landed but the Bell 206 crashed, killing all five on board. On 25 November 1978, a Socata Rallye 150 collided with a Cessna 150 over the airfield. The Rallye crashed near flying club buildings, killing the student pilot. The Cessna landed in a field and both occupants escaped with minor injuries. A report by the Air Accidents Investigation Branch concluded that the collision was caused by the failure of the Cessna pilot to see and give way to the other aircraft. The failure of the Rallye pilot to keep sufficient look-out was a contributory factor. On 21 September 1980 a Douglas B-26 Invader (registered N3710G) crashed during an air display. The aircraft was attempting to carry out a climbing roll in front of the crowd when the nose dropped sharply, and the aircraft continued rolling until it dropped vertically into a valley. The pilot and seven passengers were killed. The Civil Aviation Authority subsequently introduced rules preventing passengers from being carried during air displays. On 2 June 2001 a vintage de Havilland Vampire jet crashed during an air display, killing both pilots. The Vampire had been flying a display in tandem with a de Havilland Sea Vixen aircraft, and the likely cause of the accident was that the Vampire's flight path had been disrupted by wake turbulence from the larger aircraft. On 3 June 2001 a 1944 Bell P-63 Kingcobra crashed during a display, killing the pilot. The American Second World War fighter aircraft had been flying an unplanned sequence when the pilot lost control at the top of a climbing manoeuvre and was unable to recover from the resulting dive. The aircraft impacted the ground to the west of the runway in a steep nose-down attitude. On 30 March 2008 a Cessna Citation 501 aircraft crashed into a housing estate north of the airfield, killing all five people on board. Shortly after take-off from Biggin Hill, the pilot had reported severe engine vibration and was attempting to return to the airfield when the aircraft crashed. An investigation concluded that both engines had been shut down (possibly inadvertently) during the course of the short flight. Among those killed were Eurosport commentator and former Touring Car driver David Leslie and ex-Le Mans driver Richard Lloyd. One of the taxiways appears on the back cover of Pink Floyd's 1969 album Ummagumma. The airport is used in the film The Da Vinci Code (2006). ^ "London Biggin Hill Airport - Battle of Britain". Regional Airports. Archived from the original on 25 May 2007. Retrieved 4 January 2007. ^ "London Biggin Hill Airport - Welcome". Regional Airports Ltd. Retrieved 4 January 2007. ^ "Civil Aviation Authority Aerodrome Ordinary Licences" (PDF). Civil Aviation Authority. Archived from the original (PDF) on 28 June 2007. Retrieved 4 January 2007. ^ "Biggin Hill in 1914 and onwards". Ideal Homes: A history of south-east London suburbs. Retrieved 3 February 2017. ^ a b c d e f "R.A.F. Station Biggin Hill". Biggin Hill Productions. Retrieved 6 January 2007. ^ "Biggin Hill (Westerham)". Airfields of Britain Conservation Trust. Archived from the original on 11 June 2016. Retrieved 2 June 2016. ^ "London Biggin Hill Airport - Passenger Flights". Regional Airports Ltd. Archived from the original on 28 July 2007. Retrieved 4 January 2007. ^ "Eurocontrol Biggin Hill Airport Chart". Archived from the original on 25 August 2010. Retrieved 1 December 2017. ^ Ordnance Survey (2007). OS Explorer Map 147 – Sevenoaks & Tonbridge. ISBN 978-0-319-23927-8. ^ "London Biggin Hill Airport - Airport Plan" (PDF). Regional Airports Ltd. Archived from the original (pdf) on 22 August 2007. Retrieved 6 January 2007. ^ "London Biggin Hill Airport - Maximum Aircraft Size". Regional Airports Ltd. Archived from the original on 28 July 2007. Retrieved 4 January 2007. ^ "London Biggin Hill Airport - Aircraft Services, Handling and Maintenance". Regional Airports Ltd. Archived from the original on 22 August 2007. Retrieved 4 January 2007. ^ "London Biggin Hill Airport - Executive Handling". Regional Airports Ltd. Archived from the original on 3 June 2007. Retrieved 7 January 2007. ^ "2427 (Biggin Hill) Squadron, Air Training Corps". 2427 (Biggin Hill) Squadron, Air Training Corps. Retrieved 16 December 2006. ^ "London Biggin Hill Airport - RAF Chapel". Regional Airports Ltd. Archived from the original on 3 July 2007. Retrieved 4 January 2007. ^ "Battle of Britain chapel saved from closure by Biggin Hill Airport". Daily Telegraph. 6 January 2015. Retrieved 5 March 2016. ^ "Aviation Scout group to leave Biggin Hill Airport after 60 years". ^ "Biggin Hill Airport Olympic proposals rejected by Bromley Council". Bromley News Shopper. Newsquest. 22 March 2011. Retrieved 23 January 2012. ^ "Air Accident Report 2/78" (PDF). AAIB. ^ "Air Accident Report 4/80" (PDF). AAIB. ^ "Bad day at Biggin". Martin J Simpson. Retrieved 16 September 2008. ^ "AAIB report into 2 June 2001 accident at Biggin Hill" (PDF). Retrieved 3 April 2008. ^ "AAIB report into 3 June 2001 accident at Biggin Hill" (PDF). Retrieved 9 June 2008. ^ "Private plane crashes into homes". BBC News. 30 March 2008. Retrieved 18 July 2012. ^ Mabbett, Andy (2010). Pink Floyd - The Music and the Mystery. London: Omnibus. p. 160. ISBN 978-1-84938-370-7.